Electronic pushbutton payphones - with a microprocessor which works out the cost of the call and returns any unused coins - are currently on trial at some busy payphone sites,ranging from places like Dover docks to Glasgow Airport. A hundred of these new phones have been purchased as the first step in re-equipping our coin-box telephones. •	they will be easier to install; the built-in microprocessor eliminates the need for special call-charging equipment at the local telephone exchange, unlike the present dial payphones; and the current tariff inflexibility, which necessitates a single coin minimum fee, can now be overcome. To use these new payphones, customers put money in before keying the number. There is no pay-tone as with ordinary 'pay-on answer' payphones.The coins are held in store as a credit and the amount is shown on an illuminated display. During the progress of the call, the amount displayed diminishes as the credit runs down. The rate at which this run-down occurs depends, of course, on the distance and time of day. The microprocessor works out the rate from meter signals received from the local exchange - in the same way that ordinary phone lines are metered. are being installed for the trial, travellers often need to make long-distance calls - either over seas or within the UK. 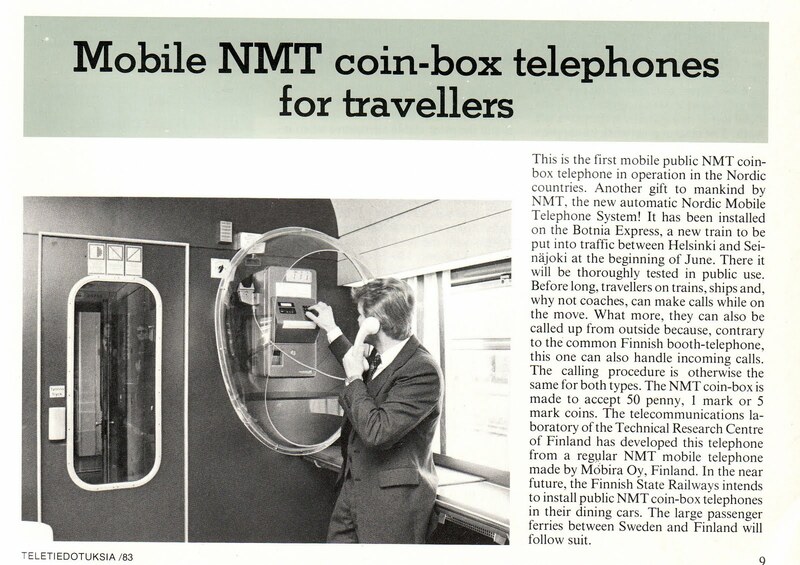 For greater convenience in making these calls the new phones will take three denominations of coins, including 50p pieces. Users will, of course, be able to make operator calls - restricted to inland initially - from the new payphones. On such calls, a`bleep' is heard as a background signal to tell the operator that the caller is using one of the new payphones. These electronic payphones have stainless steel cases, with the instructions on them printed in blue. Signs, are also in blue, and hence the new coin telephone is known as the 'Blue Payphone'. Instructions posted inside the kiosks explain how the new phones arc used. During the trial, we shall be carrying out customer research, asking users their opinions of the new phones. We will also be checking on the use people make of the new phones compared to ordinary payphones nearby. 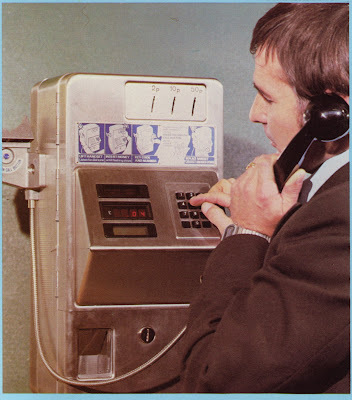 The trials are proceeding satisfactorily at present, and plans are in hand to replace 17,000 public call office (PCO) sites, which take more than £1,200 per annum, with these new payphones. There are Currently 77200 PCO sites which are due for replacement under the re equipment programme to be completed by 1990. Most of these will be replaced by a cost reduced, modified version of the blue Payphone, which will use more up-to-date technology, but some 1700 will be replaced by a new debit-card phone, which as its name implies will be coinless. be installed on a trial basis mainly at high revenue public call office (PCO) sites throughout the UK. THERE CAN hardly be a single telephone user who would not like to see Pay On Answer (POA) telephones quickly phased out. Their fault record, their inability to make certain international calls, the need to stack up coins when making expensive calls and the interruption to speech when coins are inserted, are all features which have caused much irritation over the years. And as far as the Business itself is concerned, the tariff inflexibility, which necessitates a single coin minimum fee, is not popular. Steps are being taken, therefore, to replace POA and the first move is to re-equip the 16,000 public call office (Pco) sites which take more than £1,000 a year. In all there are currently 77,600 Pcos. Senior Technician Ray Guntripp, from LTR West Area sizes up an A233, soon to be fitted at Heathrow Airport's Terminal 2. Lending a hand in the foreground is colleague Brian Dare. metering (DPM) relay set in the local exchange and its tariffs therefore are basically linked to ordinary subscriber tariffs rather than coinbox tariffs. Introduction of the equipment into service marks the culmination of three years of work undertaken initially by a small THQ team but, since the contract was placed in December last year, by a full THQ project team which has wrestled with the managerial, technical and personnel problems connected with the introduction of this sophisticated new equipment. Unlike POA which employs direct coin collection by collecting money first and then putting paid time at the user's disposal, the Blue Payphone employs indirect collection by offering conversation time corresponding to the amount of money inserted. On completion of the calls, only those coins needed to meet the accrued charges are collected - starting with the highest value coin which has been spent. Making final checks before the new payphone leaves the workshop is Inspector Terry Parker. full range of operator services available to ordinary subscribers lines. To the customer the making of operator assisted calls is basically no different from POA. Non-chargeable calls are obtained by keying 142, 151 and so on in the normal way. In the case of chargeable calls, the operator, who will recognise the Blue Payphone due to the presence of a special identification tone, will ask the customer to insert money when the called subscriber answers. This money will pass straight into the cash box - unlike the procedure for automatic calls. Should the customer insert money immediately on lifting the handset and then key any three-digit operator code, the coins will be refunded after the last digit has been keyed. It is possible to follow an automatic call by a chargeable (or non-chargeable) operator control call after using the follow-on call button. 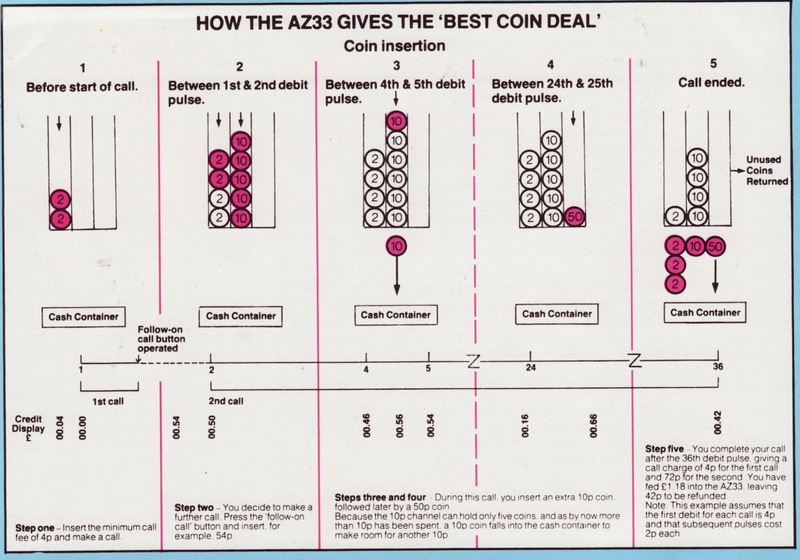 In such a case, coins inserted for the original automatic call are held in the coin store with the display showing credit remaining from the automatic call. Additional payment is made for the chargeable operator-assisted call as requested by the operator. When the customer finally replaces the handset the equipment will cash up for all automatic calls made, in the normal way. In other words, when the follow-on-button has been used, payment for automatic and chargeable operator connected calls are treated as separate cash transactions. - total capacity 4k bytes - has had to be used for this purpose at the expense of self-diagnostic facilities which the az33 is capable of providing. 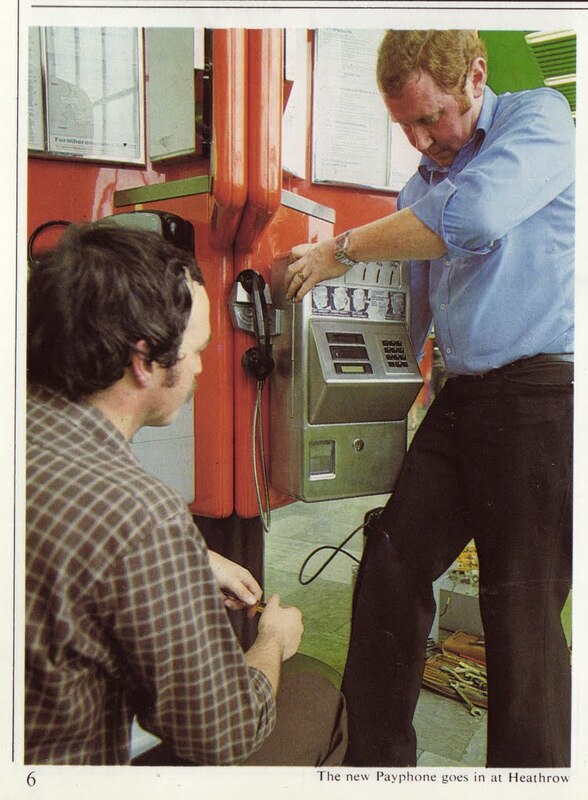 In the field trial only, a second telephone pair is being specially provided to carry automatic diagnostic reports to the repair service centre. These reports will be limited to notifying a full cash container which would put the coin telephone out of action for paid calls or a coin checker/ mains failure fault. The Az33 is how ever designed to need not more than three maintenance visits a year - excluding vandalism. There are a number of technical advances in the Az33 design. Coin validation is a crucial feature of any coin telephone and in this case, coins are subjected both to physical and electronic checks. 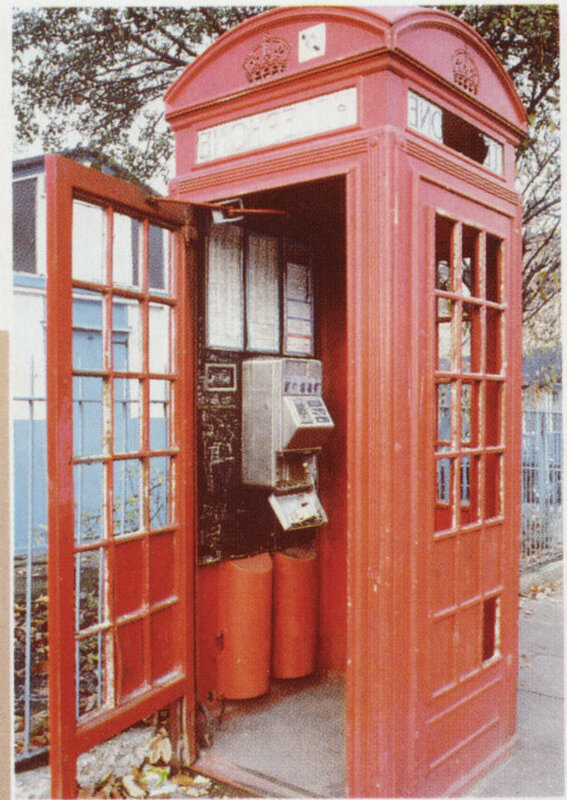 By virtue of its self contained design segregated coin telephone lines are no longer required and this will permit greater flexibility in exchange planning and eventually enable non coin and fee checking equipment to be removed once full production of self-contained payphones is under way. Tariff changes are effected simply by changing a coded plug in the control unit. The coin telephone is mains powered. If there is a mains failure while the equipment is in use it will retain any money due until power is restored and return unused coins to the refund chute immediately. The 999 emergency service only will continue to be available during mains failure. The cash compartment contains a 2.6 litre cash container with a self locking mechanism which closes the coin aperture immediately the container is removed. Once this has been emptied in the coin counting centre, and before being replaced inside the coin telephone, it is necessary to re-set the self-locking mechanism inside the lid of the container. 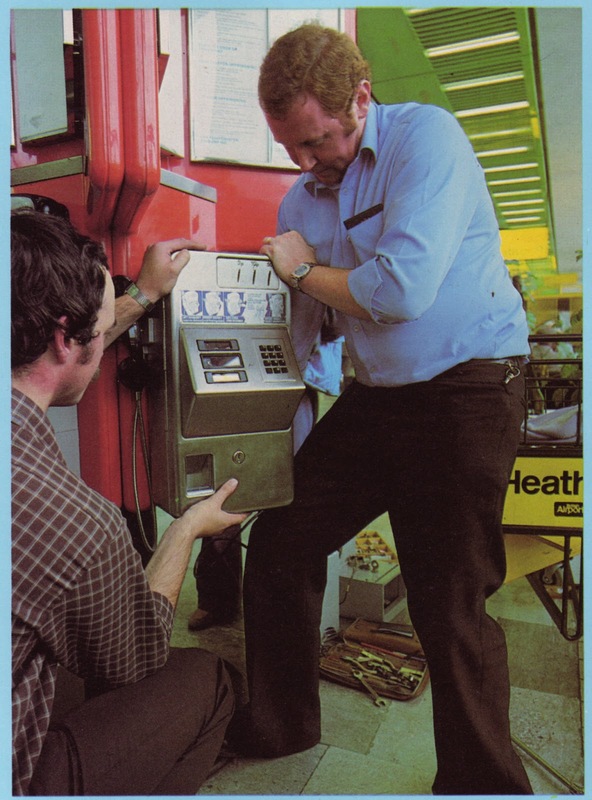 A coin meter, registering 1p units, is fixed to the cash compartment door and this is read each time the container is removed so that an accurate record of cash takings can be maintained. It is likely that these will be considerably in excess of POA equipment being replaced. The field trial Blue Payphones will normally be recognisable by a blue sign over the kiosk bearing the words `Intercontinental and Inland' to distinguish them from POA phones. When all the trial sites are operational more than 3,000 operators accepting calls from the trial sites will have been trained and 20 fitters and 30 maintenance staff will have undergone training at RETC Bletchley. About 12 presentations will also have been given to COPOU, and its constituent bodies, and to Regions and Areas taking part. There will, of course, be the inevitable teething problems in launching the field trial. But once this has been completed, by mid-1980, the intention is to place s, full production order and complete re-equipment of high revenue Pcos within about five years. Simultaneously, a separate pro¬gramme has been initiated for a medium/low revenue coin telephone which would be slightly less sophisticated than the high revenue variety and possibly quicker to produce. At the same time, an in-depth study has examined the practical problems involved in providing public telephone service from equipment operated by pre-paid debit cards in lieu of coins to back-up - but not replace - coin-operated pay-phones. When the result of this study is to hand, together with a parallel study of technical possibilities, the Post Office will be in a position to decide when to begin and get some practical experience in the use of card phones as the third prong in the attack on the re-equipment of public call offices. Mr L. L. Grey is a Head of Section in the Residential and Customer Service Department and is Project Manager for the AZ33. Most people are aware that a new generation of microprocessor controlled payphones will be progressively replacing the pay-on-answer ( POA) boxes. But few of those who have been involved with the maintenance of electro-mechanical POA boxes will mourn their passing. For introductory purposes. the new range of payphones are divided into three tiers. 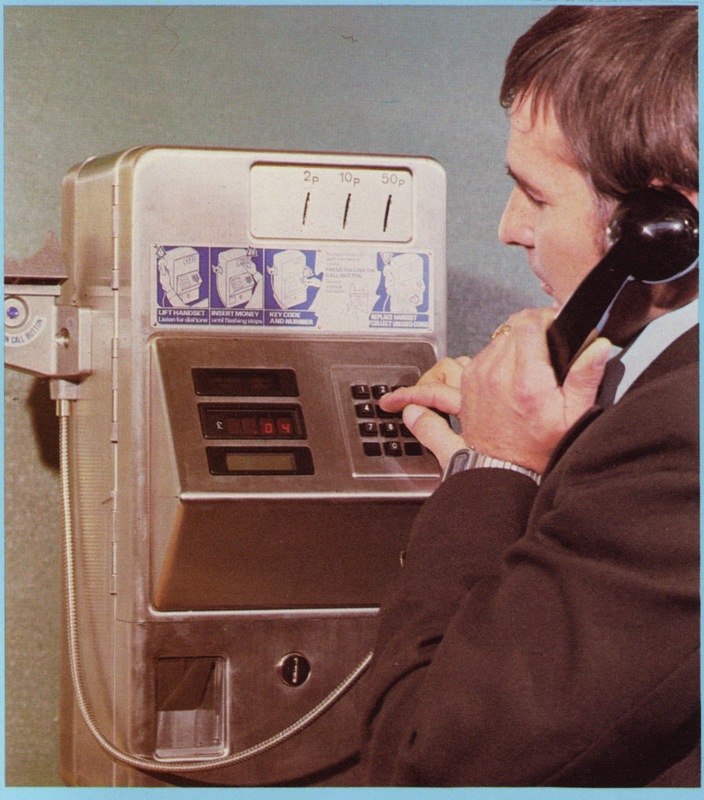 Tier 1 is the Blue Payphone, a name most of us are now familiar with. For engineers it is more correctly coded Coin Telephone 22A (CT22A) and on trial now. A production model to follow will be coded CT22B. Both are primarily for high revenue sites. Tier 2 is a re-designed. cheaper version of Tier 1, and will be used for ordinary public call offices (PCOs) and renters installations. Tier 3 is a portable, table-top instrument with reduced facilities compared with Tier 1 and 2 -Ideal for hotels, restaurants and similar establishments. Another item in the new range is the Debit Card Payphone -Intended to accept specially designed credit cards. with the need for a Coin and Fee Checking (CFC) relay set. The approach to fault finding and clearance is going to be very different from the POA coin box. Instead of coin acceptors, pulser units. runways and so on, the faultsman's language will be Central Processor Units (CPU). Speech and Interface (S and I) boards. Power Supply Units (PSU). credit displays, edge connectors and the like. Faultsmen will have a diagnostic kit to help them and, by using the diagnostic testing facilities built-In the CT22. they will be able to approach their task in a truly professional manner. The recommended methods of handling this equipment- particularly the printed Circuit boards- are different from the accustomed practices of faultsmen. For example circuit boards with edge connectors must be extracted and Inserted only when absolutely necessary. They must be handled with extreme care, always carried in anti-static bags, and provided with adequate protective covering. In time faultsmen will need to become expert in the facilities, and capable of recognising the causes of the more common types of failure. This equipment should help create pride in the work, which most found difficult when working with POA apparatus. missing, customers anxious to use the box being worked on, noisy railway stations, bustling airport buildings ·-and many others. This is an exciting challenge which faultsmen will be facing if British Telecom is to seize this opportunity to provide the type of PCO service the public demand. A first class maintenance effort is necessary even though these processor-controlled payphones are remarkably advanced machines. They must not be taken for granted. After working on a box. a faultsman must run though the facility test schedule and satisfy himself that all is as it should be. This includes a check to ensure that both the ear and mouthpieces are correctly fastened with rivets. Another point to remember is that most members of the public will initially find the new PCOs very strange and some may not be able to understand the instructions. Maintenance staff may be called upon by frustrated customers to explain, and this should be done in a way that will inspire confidence. No doubt some customers will expect to get coins refunded when they are not entitled to them. But the new call office mechanism does not give change, it only returns those coins not used during the call. For example, if a user puts one 50p piece into store, makes a call to the value of 10p, then hangs up, the machine will claim the whole of the 50p. But if at the end of the caII. and before hanging up, the user inserts a further 10p piece, the payphone will claim the 10p piece and return the 50p to the user when the handset is replaced. Correct handling of electronic printed circuit boards (PCBs)- both and out of the machine. There will be much for faultsman to learn during the early days of the new equipment. It will be very important when new problems or difficulties are found that help should be sought. They should also pass on promptly the lessons which have been learned to the right people. Engineering groups at RHQ and THQ will be keen to give help and information to field staff to resolve problems as they arise. Developments in public call offices will give British Telecom a good opportunity to improve the public image of this important service- at the same time giving staff the chance to work with equipment using present day technology. This instruction describes the CoinTelephone No 22A and outlines its facilities, 100 of these cointelephones have been purchased for field trial in selected Areas. These are pre-production models and some changes will be incorporated if further quantities are purchased. 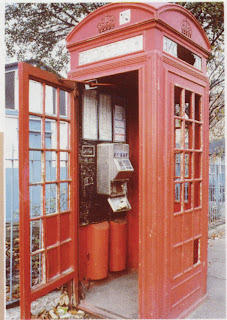 The Coin Telephone No 22A is a self-contained, mains powered, prepayment unit intended for use on high revenue sites particularly where there is a large element of continental and intercontinental traffic.It offers facilities suitable for IDD, STD and local calls and accepts 2p, 10p and 50p coins. The instrument incorporates a keypad and credit display. Full operator access is available. Figures 1 and 2 illustrate the description in the following paragraphs. The casework design offers a high degree of security against unauthorized entry. The upper, mechanism, compartment has a door hinged on the left and secured on the right by a good quality lock operating a bolt system. The lower, cash compartment has a drop door secured by a similar lock and bolt system. 3.2 The coinbox is secured to a mounting frame by bolts which are accessible only from inside the cash compartment and mechanism compartment. The mounting frame is fixed by bolts which can only be reached when the coinbox has been dismounted. 3.4 The handset is supported in the pendant position on a forked gravity switch hook on the left of the box. A standard PO handset No 11 is used but the plastic cord is replaced by flexible conductors in a flexible stainless steel sheath anchored securely to the handset and gravity switch assembly. 3.5 The gravity switch hook assembly carries a follow-on call button on the front face which in obscured by the handset when it in on-hook. All components of the assembly are readily interchangeable after removal of a plate on the rear of the assembly. The whole assembly is secured to the case by a spigot which passes through a heavy steel collar on the inside of the case. Rotation of the collar clamps the spigot with a powerful cm action. Connections from the gravity switch hook assembly are by means of plug ended card*. 3.6 The mechanism compartment door carries a sloping, protruding console which houses the keypad, credit display and bell and contains three windows for instructional displays, credit display and exchange number label in that order from top to bottom. ed as a 'power on' function indicator for the box. The PWB at the rear of the display unit carries the logic for the unit and the clusters of filament lamps which illuminate the two user instruction displays in the upper display panel. in the left hand half and '9990NLY' legend on the right. They are invisible until illuminated from the rear, (Note: on the trial boxes the 999ONLY legend is not used.) Connections are via plug ended ribbon cable. 3.10 The bell is a single coil, single gong unit fixed by two screws and connected by plug ended cable. A friction device permits adjustment of the eccentric gong without loosening the center fixing screw. 3.11 The exchange number label is a self-adhesive slip inserted from the inside of the owe by removal of the credit display unit (3 screws). (b) the test flap operating solenoid and common slide bar. (c) the accept solenoid and common slide bar. (d) the three coin checkers. (e) the solenoid driver PWB. Each coin checker is individually removable by undoing a knurled thumbscrew and withdrawing from a support pin. When in place the coin checker accept and test flaps are operated on all three coin checkers simultaneously by the solenoids and slide bars. 3.14 Each coin checker is based on a moulding in a wear resistant, low friction, plastics material. The moulding, in cooperation with a hinged test flap, provides a coin entry and testing channel which gives access to either a reject channel or storage channel in the lower portion of the moulding. Rejected coins pass straight through the reject channel and are returned to the customer. Accepted coins pass into the storage channel and are either cashed under the control of a cashing electromagnet or refunded on operation of the refund electromagnet. each coinchecker carries a PWB containing the control and drive circuitry for the electromagnets and the circuitry for carrying out a materials check on each coin. 3.15 Connections to all three coin checkers and to the solenoid driver PWB is by means of a connection PWB carrying appropriate connection sockets and plug ended ribbon cable. 3.16 The microprocessor PWB and Speech and Interface(S&I) PWB are carried in a pivoting frame in the main case of the box. The frame locks in both closed and open positions and must be lifted before it can be moved. The PWB's slide in guides and edge connection strips engage with socket connectors on the frame. Each PWB carries two card ejectors to facilitate withdrawal of the card from its connection socket. Replacement of a board requires only that the board is slid into its guides and firmly pressed home in the connector by pressure on the ejector. The cards are keyed and cannot be interchanged. The microprocessor PWB carries the processor and associated logic, accounting and timing components. The S&I PWB carries the telephone speech circuit, alarm circuitry, meter pulse receiver and the components which enable the processor to monitor the circuit conditions which arise during the operation of the box and to implement its control signals. 3.17 The Power Supply Unit (PSU) is mounted in the main case below the main PWB's. It is by far the bluest part of the "blue" payphone. 5v do for credit display and instruction indicator lamps 5v do for mains failure refund logic. 34,000 micro farads of smoothing/storage capacitors are sufficient to bridge power input interruptions of up to 1 second duration without impairing the function of the box. In the event of a longer break there is sufficient stored power available to refund unused credit to the user and release the call. Coins in store representing used credit are held in store and not cashed until power is restored. 3.18 Power consumption of the CT 22A varies from 4.8 w when the box is quiescent to a peak load of 36 w during solenoid operation. 3.19 The 24v ac supply to the box is normally provided by an independent 240/24v step down transformer. 3,20 Tariff setting is determined by a pre-programmed, plug-in unit on the microprocessor PWB. A tariff change entails replacement of the plug-in unit. 3.21 The cash compartment cover carries the refund cup which is provided with two hinged flaps. The outer flap is of clear plastics material which allows customers to see coins lying in the bottom of the cup. To reach the coins the flap has to be pushed backwards and in this position the flap closes the aperture via which coins reach the cup from the upper compartment. To provide additional security against unauthorised access to the mechanism compartment -a second, stainless steel, flap normally closes the aperture from the mechanism compartment under the tension of a light spring. The weight of a coin is sufficient to depress this flap to allow the coin to drop into the cup. 3.22 The cash container content meter is mounted on the right hand side of the cash compartment cover. This meter registers the total value of coins falling into the cash container. The meter is sealed. 3.3 At the rear of the cash compartment is a rod protruding forwards which, when the cash container is inserted, opens the container coin entry shutter and holds it open whilst the cash container remains in position. Removal of the cash container releases the shutter to seal the container. After this, the container cannot be re-inserted until it has been unlocked and the shutter mechanism has been reset from within. 3.24 The cash container is of stainless steel construction and has a volume of 2.6 litres. It incorporates a coin level detector which, when the container is full, conditions the coinbox control circuitry so that further coins inserted are returned to the customer. In this condition only non-chargeable calls can be made. 3.25 A cash container presence detector in incorporated in the cash compartment. This also ensures that unless a cash container is in situ only non-chargeable calls can be made. 4.1 The operation of the CT 22A is controlled by a microprocessor. All functions in the box are operated, directly or indirectly, by signals generated by the processor and all functional elements generate signals which are fed to the processor to enable it to monitor their status. The processor responds to signals fed into it in accordance with a predetermined programme which covers all possible conditions and sequences of operation. Flashes the credit display until the minimum call fee has been inserted. 4.2.1 As the user inserts coins they are validated by the coincheckers and either taken into the storage channel(s) or rejected. Each valid coin's value is registered in the processor's memory. When the minimum call fee has been recognised the processor causes the credit display to stop flashing and turns off the 'INSERT MONEY' sign. It also removes the inhibition on the keypad which permits only 3 digit numbers to be keyed. 4.2.2 Provided that the exchange has returned dial tone the user may then key the required number. Each key depression is signalled to the processor which stores them sequentially in the memory. As, soon as any keyed information arrives into the memory the processor then proceeds to transmit it, in the form of standard loop/disconnect impulses, to the exchange. The timing of the pulses in under the control of the processor and a crystal clock which is used as the time base for all functions of the box. 4.2.3 After all keyed-in information has been sent to the exchange call routing and connection is performed by the exchange in the normal manner, ringing tons is fed back to the user. 4.2.4 When the called subscriber answers the Subs Private Metering Relay Set (SPM) in the exchange feeds a meter pulse out to the coinbox in the form of a balanced 50 hz signal on both legs of the line, to earth. The Meter pulse receiver in the coinbox recognises this signal and signals the processor which records the event in the memory and starts timing the interval to receipt of the next pulse. The processor also decreases the reading on the credit display by the minimum call fee. Conversation may now proceed. 4.2.6 When the second meter pulse is received the event is recorded and the time interval between it and the first pulse is noted. This interval identifies the charge rate in use on the call which has been made. (a) in order to give exact value for money the call timing has to be related to the value of the minimum coin which can be inserted. (b) a call charge rate rather higher than that appropriate to a ordinary subscriber has to be levied to cover the additional cost of providing and maintaining the call office. Thus, based on the exchange meter pulse rate, the coinbox starts to generate debit pulses timed by its own clock which it uses in place of the meter pulses to control the timing of the call. 4.2.8 Ten seconds before credit is due to expire (as timed by the internal clock, ) the processor injects 5 pips of 400 hz tone into the speech circuit, starts to flash the credit display and lights the 'INSERT MONEY' sign. If money is inserted these signals stop, the value of the money inserted is added to the credit display and the call continues. If money is not inserted the processor disconnects the call as soon as the time paid for has expired. NOTE The foregoing paragraphs 4.2 - 4.2.8 have been set out to illustrate the role played by the processor in controlling the operation of the coinbox. From here on the detail of processor intervention will be omitted and only the effective information described. 4.3 On any call, if the user wishes he may terminate the call by pressing the follow-on call button. This will cause the exchange connection to be released but will not initiate the cashing-up procedure. On release of the button dialling tone will be received and the remaining credit, (provided that it is above the minimum call fee,) may be used to make further calls. 4.4 When the handset is replaced the call in progress will be terminated and the cashing-up procedure will take place. The box will automatically cash into the cash container coins to cover the value of the call which has been made and will return coins in excess of this value to the user. The box will take the minimum value from the coins in store which will cover the cost of the call. This is referred to as 'Best deal accounting'. 4.5 If 1 x 50p coin, 2 x 10p coins and 4x2p coins have been inserted - which will be shown on the credit display as 00.78p - and the cost of the call made is 26p, the box will cash the two 10p coins and three 2p coins and will refund the remainder. If the cost had been 52p the 50pcoin and one 2p will be taken, and the rest will be refunded. 4.6 If a single 50p coin has been inserted and the cost of the call(s) made amounts to, say 22p, if the handset is replaced at the end of the call the box will be forced to take the 50p coin. 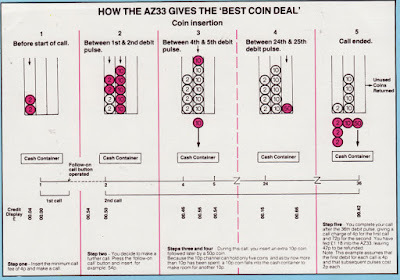 However, by terminating the call with the follow-on call button the user will then have the opportunity to insert smaller coins to the value of 22p so that when he replaces the handset the box will cash the 22p and return the 50p coin. 4.7 Incoming calls may be received by the box. When such a call is received an identity tone consisting of alternate pips of 800 and 1200 hz tone will be connected to the speech circuit for a period of 10 seconds. This will enable a distant operator to recognise that the call is to a coinbox and, if a reverse charge call is required, she will be able to collect money from the coinbox user taking the call before connecting. 4.8 Outgoing operator controlled calls. 4.8.1 Three digit codes may be keyed without insertion of money. After the 3rd digit has been keyed the credit display stops flashing. When such a code is keyed the box will condition itself to refund any coins inserted for a period of 40 seconds after the final digit has been keyed. This is to prevent money being inserted and stared before it can be monitored by an operator. Coinbox identity tone is generated and will remain on for the duration of the call. These are similar to those to chargeable codes but the identity tone is not generated and the box will refund inserted coins throughout the call. 4.9.2 Minimum diameter, minimum thickness and the material content of coins are checked by the coin checker. For the thickness and diameter check see E5C 3103 for details. 4.9.3 The material check is carried out electronically whilst the coin is momentarily held stationary in the coin runway. 4.9.4 The passage of the coin from the point of entry to the coin checker to the position in which the material check is carried out is timed precisely. If this is not completed within a set time, eg because the coin is on a string, the coin will be rejected and the string (if any) will be cut, If the time is exceeded due to the presence of foreign material in the runway, the release of the coin check flap is likely to cause the coin to be rejected and the foreign material to drop clear. When the handset's on hook the box is programmed to perform a self routining sequence. On the boxes to be used for the field trial this will be limited to monitoring the cash container full probe and detection of an obstruction in any of the coincheckers. Detection of a coin checker obstruction causes the release of an alarm relay. Since this relay will also release in the event of a power failure this condition also will be detected. In the event of a cash container full condition being detected the alarm relay will flash and cause alternate loops and disconnection's to be applied to a second pair back to a central point. In the event of a coin checker obstruction the alarm relay will release permanently and connect a permanent loop to the fault reporting pair. The same condition will apply in the event of power failure. 4.12 For the purposes of the field trial the fault reporting cable pairs will be terminated on a specially provided equipment located at a suitable central point. An alarm condition will cause a lamp to light - flashing for a cash container alarm, steady for a fault requiring engineering attention. An optional audible alarm will be provided together with a 'receiving attention' facility. Removal of the alarm condition from the fault reporting pair will give a positive indication at the central station.